Introduction: Today the world is facing the adverse effects of violence. Countries which once thrived on violence and terror are fast realising the futility of hatred. This article which was published in the Sunday Statesman, Kolkata 8 February 2004, asserts that Gandhi's philosophy of nonviolence is being accepted worldwide to create a peaceful and harmonious society. Gandhi is now emerging as the saviour of a world threatened by superpower violence, even in Gandhi's life time great minds of the world saw in his work the promise of a new world. One of them is Romain Rolland (1866-1944) who wrote in his Mahatma Gandhi: The Man who Became One With the Universal Being (1924): "With Gandhi everything is nature, modest, simple, pure ―while all his struggles are hallowed by religious serenity." Gandhi's gentle religious temper which was active in his politics was, however, observed 15 years earlier in his first biography Joseph J Doke's Gandhi, A Patriot in South Africa (1909). If you wish to seize the essence of Gandhi's political philosophy read his presidential address at the annual session of the Indian National Congress held at Belgaum in 1924. 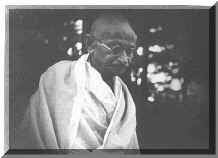 The Mahatma said at the end of his address: "Satyagraha is search for truth; and God is Truth. Ahimsa and Nonviolence is the light that reveals that truth to me. Swaraj for me is a part of that truth". Mahatma Gandhi is slowly but steadily emerging as a spiritual and moral hero on the international scene. The Great German existentialist philosopher, Karl Jaspers (1883-1969), wrote in his The Future of Mankind (1958): "Today we face the question of how to escape from physical force and from war, lest we all perish by the atom bomb. Gandhi, in word and deed, gives the true answer: only a supra-political force can bring political salvation." This is the voice of the world conscience and this is an echo of the voice of Gandhi. The voice may not reach all ears. But they have reached at least some ears. What is strange is that Germany, a country responsible for the Second World War, is the country which his now stressing the need for Gandhian non-violence in the modern world. Actually Germany began to understand Gandhi as early as 1931 when Rene Fullop-Miller published his Gandhi: The Holy Man. He said that political problems must be solved in the Gandhian way: "Gandhi's nationalism contains none of those elements which makes nationalist movements of the West seem a menace to peace." This is a plea for a Gandhian approach to political problems which is now, generally speaking, the German elite's view of Gandhi's nonviolence. Let us see the attitude to Gandhian nonviolence of the greatest physicist of the modern world after Einstein, Werner Heisenberg. In an essay on Gandhi he says that "Gandhi's teaching of nonviolence could prove to be stronger than the vague impersonal conception of an international court of justice. Gandhi's unique example shows that a true personal involvement together with the total rejection of force could be very successful politically." In 1969 Dr Heimou Rau of Max Mueller Bhavan, New Delhi, edited a collection of essays which was published with the title Mahatma Gandhi As Germans See Him. It contains 16 essays by eminent German intellectuals on the life and teaching of Gandhi. The essays show how Gandhi's philosophy of nonviolence has influenced the German mind. How Gandhi's ideal has touched the soul of the Anglo-saxon world we can see in Ronald J Terchek's Gandhi Struggling for Autonomy (1999). The work explains Gandhi's idea of the swaraj of our soul which alone can fulfill our political and social obligations. No less important is Gandhi in His Time and Ours by David Hardiman, a professor at the University of Warwick. Hardiman seizes the essence of Gandhi's ideas when he says: "Gandhi's approach represented a state of mind and not any theory." Gandhi's spiritual and moral approach to our political problem is particularly important today after the US declaration of war on terrorism. To realise this we have to value Gandhi's idea of reflection on our self and see what we are. The Pentagon's hitting power will not end terrorism. It will only make it more rampant. Let us hope that the people of America, once nursed on the idealism of Emerson, Thoreau and Whitman will soon begin to understand Gandhi and will abandon the spirit of revenge which now regulates the US policy of dealing with terrorists. You cannot bring peace through violence. The most effective answer to violence is nonviolence. Gandhi said in one of his articles in his Harijan (1938): "If even one great nation were unconditionally to perform the supreme act of renunciation, many of us would see in our lifetime visible peace established on earth."